Get $20 in store credit with all iPhone repairs! Choose from great accessories such as phone cases from Speck, Spigen, Under Armour, UAG, and more. Plus Bluetooth speakers, screen protectors, charging cables, and other great accessories. At Helpertech you’ll find friendly technicians who can solve your mobile device problems, from iPhone repair and iPad repair, to computers, laptops, and game consoles. Whether you’re looking for phone repair Burnsville options, computer service, or other electronics repair – our expert techs are here to help! At County Rd 42 and Hwy 35E in Burnsville. You can find us on the south side of County Rd 42, across from Burger King. In 2016 the first Helpertech store opened in Eagan, and the second store in Burnsville opened in early 2017. 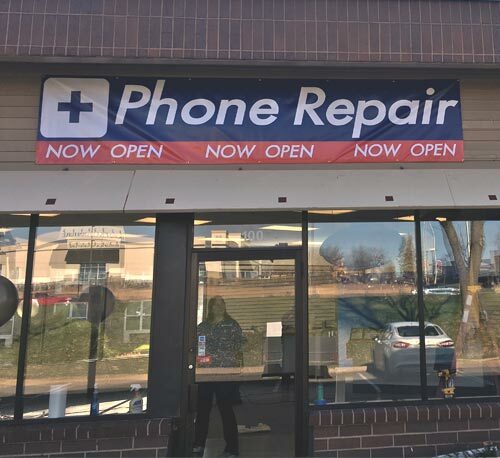 That store moved to its new and current location in late 2018, and operates there providing 15 Minute iPhone Repair to the surrounding community, with no appointments needed and friendly technicians to get your devices fixed fast. We’ve been fortunate to serve the local area for years, with our stores and service offerings evolving with the fast pace of modern technology. We offer fast iPhone repair, iPad repair, and mobile device repair on most major brands – including Apple, Samsung, HTC, Dell, Motorola, LG, HP, and more! Got something you need us to fix? Give us a call or contact us with an email. If it’s electronics or technology like a camera, game console, monitor, circuit boards, or even if you don’t see it listed here on our site, there is a chance we can fix it for you! We have the tools and equipment to perform all sorts of electronic, solder, and board level repairs. So, just let us know what we can do for you! It’s not just phone repair Burnsville customers appreciate, we can take care of your iPad too! Stop in to our store, and our technicians will help with your device on the spot for issues like cracked screen repair, broken glass repair, battery replacement, virus removal, memory upgrades, data recovery, water damage repair…and pretty much anything else that can go wrong with your technology! Our focus on customer service and fast repair has afforded us a great reputation with hundreds of amazing 5 star reviews from our customers. We’re happy to be a part of the local community, and provide our services to you. Samsung Galaxy and Tablet Repairs Too! Not just iPhones and iPads, we can also repair your Samsung Galaxy Note, Galaxy S series phones, and Samsung Galaxy Tab series tablets. 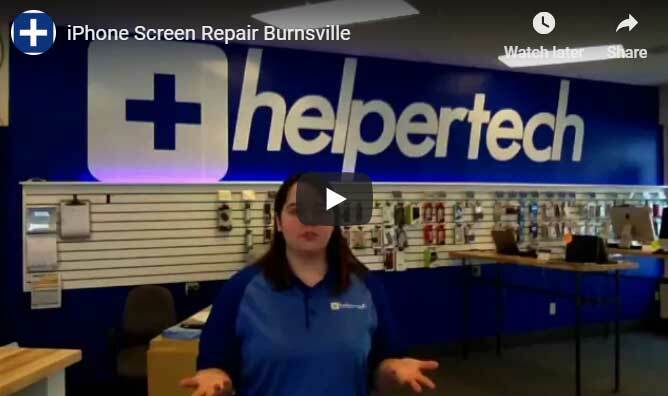 Dropped, damaged, kicked, shattered, or water damage – for all your screen replacement, home button,and battery replacement needs, just stop in to Helpertech phone repair Burnsville. Relax in our customer lounge while our technician quickly repairs screen, battery, or whatever other ailment your device may have. In the rare case that we cannot fix your phone or iPad, we have a selection of used and refurbished devices as well. Broken iPhone? Get It Repaired In 15 Minutes! No need to wait in line for hours for some “genius” to fix it! Got better things to do, instead of standing in line or wasting time while you wait for your smartphone to get fixed? We felt the same way…that’s why we made it our goal to provide the fastest cell phone repair around! 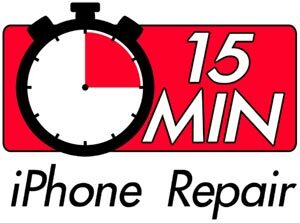 We can fix your iPhone in just 15 minutes. From screen repairs, battery replacement, and buttons, to cameras, audio jacks, and charging ports – we can do it all in just 15 minutes per repair! 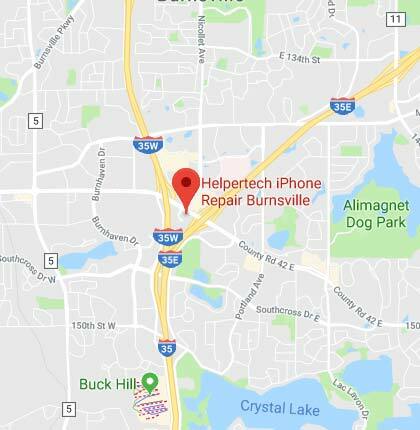 Even if our store is a bit of a drive for you – you can expect to get back to work, play, or life faster when you choose Helpertech phone repair Burnsville for your repair needs! Consider this – most repair shops will take 1-3 hours to fix your phone, or even longer. So, what if you are 15-20 minutes away from our store? Well, you’d still get your phone fixed faster by driving to our store! Twenty minutes travel time to get here, fifteen minutes for repairs on your device, and twenty minutes driving back to your location, and you’re still under one hour of total time! Even if you hang out in our store for a bit, you’re still getting back to your life much faster with Helpertech. You can read what many of our satisfied customers have to say by checking out our reviews here on our website, or at any popular directory online. 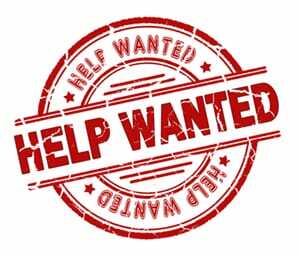 If you’d like to leave us feedback and share your experience with Helpertech you can do so by clicking on the link below. We’d love to hear from you!